It’s February! The month of love and discounted candy! HUZZAH!! Anyway, on with the first part of this month’s journal challenge! As always, please feel free to join the conversation in the comments! I’d love to hear everyone’s thoughts and whatever awesome things you all are up to! This inscription could be seen on the glass door of a small shop, but naturally this was only the way it looked if were inside the dimly lit shop, looking out at the street through the plateglass door. Outside, it was a gray, cold, rainy November morning. The rain ran down the glass and over the ornate letters. Through the glass there was nothing to be seen but the rain-splotched wall across the street. Suddenly the door was opened so violently that a little cluster of brass bells tinkled wildly, taking quite some time to calm down. The cause of this hubbub was a fat little boy of ten or twelve. His wet, dark-brown hair hung down over his face, his coat was soaked and dripping, and he was carrying a school satchel slung over his shoulder. He was rather pale and out of breath, but, despite the hurry he had been in a moment before, he was standing in the open doorway as though rooted to the spot. Before him lay long, narrow room, the back of which was lost in the half-light. The walls were lined shelves filled with books all shapes and sizes. Large folios were piled high on the floor, and on several tables lay heaps of smaller, leather-bound books, whose spines glittered with gold. The far end of the room was blocked off by a shoulder-high wall of books, behind which the light of a lamp could be seen. From time to time a ring of smoke rose up in the lamplight, expanded, and vanished in darkness. Just gonna put that there . . . Listen, I’m not an encyclopedia of love poetry! Maybe something Whitman wrote? 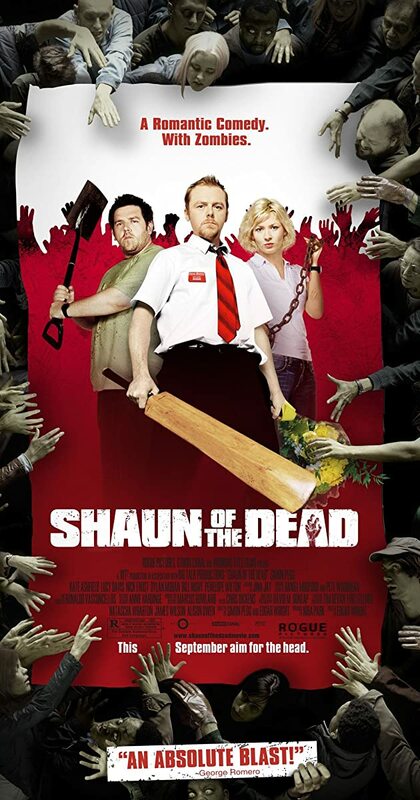 Shaun of the Dead, BAR NONE. I promise this isn’t hyperbole, but I love all languages — even English! It’s just so amazing to me that we humans have all these sounds and characters and symbols to describe everything from trees to the concept of gravity. You’ve got Arabic, Italian, Spanish, Russian, Japanese, French, Korean, Swahili, and Welsh with all those wacky y’s! And those are just the more well-known languages; I know there’s THOUSANDS in the world, with equally amazing people speaking them. I love it! Heh, this is probably going to be embarrassing, XD. I was a bit slow to the whole “crush” game — though I’m pretty sure my first was Steve from Blue’s Clues . . . I didn’t really get into the celebrity scene, either, until I was in college. (Besides Daniel Radcliffe because Harry Potter.) I also don’t really crush on fictional characters so much as the actors playing them (yes, even voice actors). Though I always had a weird adoration for Clopin from Disney’s The Hunchback of Notre Dame . . . Hm, I’m learning new things about myself . . . I mean, I’m sure there are some good ones out there . . . I guess what I dislike about Valentine’s Day is the PRESSURE put on couples to get yet another fancy present, do this other fancy thing, show how much you love each other to the whole world, etc. That’s kinda what anniversaries already do, whether for dating or marriage (so basically, if your anniversary is February 14th, you’re pretty much golden). And there’s similar pressure if you’re single (and don’t want to be), and there’s just that painful loneliness and desperate sadness you feel. It’s not nicknamed “Single Awareness Day,” or “SAD,” for nothing. But if you treat Valentine’s Day as more of a fun thing, just a specifically timed date night or an excuse to do something you two have been wanting to do together, then that’s what’s fun. I like that aspect of the holiday. And also all the candy. Mine is blue (obviously). But specifically, it is the color of the Crayola cerulean blue crayon. I tried googling “cerulean,” and there’s many varieties, but not that exact beautiful shade and hue of blue. What are your February plans?